Today’s employment situation release depicted a picture of continuing recovery in the labor market. One interesting aspect is what is happening to the tradables sector, which I proxy with the manufacturing sector. There, the advance data indicate a slight decline. 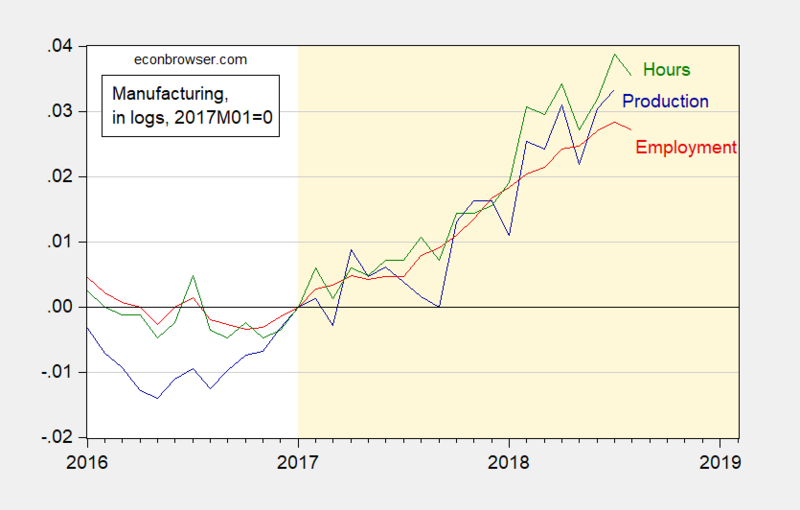 Figure 1: Manufacturing production (NAICS) (dark blue), manufacturing employment of production & nonsupervisory workers (red), aggregate hours of manufacturing employment of production & nonsupervisory workers (green), all in logs, normalized to 2017M01=0. Source: Federal Reserve, BLS, via FRED. One observation is not a trend, so of course, one wouldn’t want to infer too much from these data points. However, if manufacturing output follows employment, and next month’s employment numbers follow this month’s trend, then it’ll be time to wonder if the combination of appreciated dollar, trade policy uncertainty and slowing growth abroad are going to hit the expansion. On the dollar, note that the upswing is partly due to incipient Fed moves, but some portion is due to heightened policy uncertainty and expansionary fiscal policy. 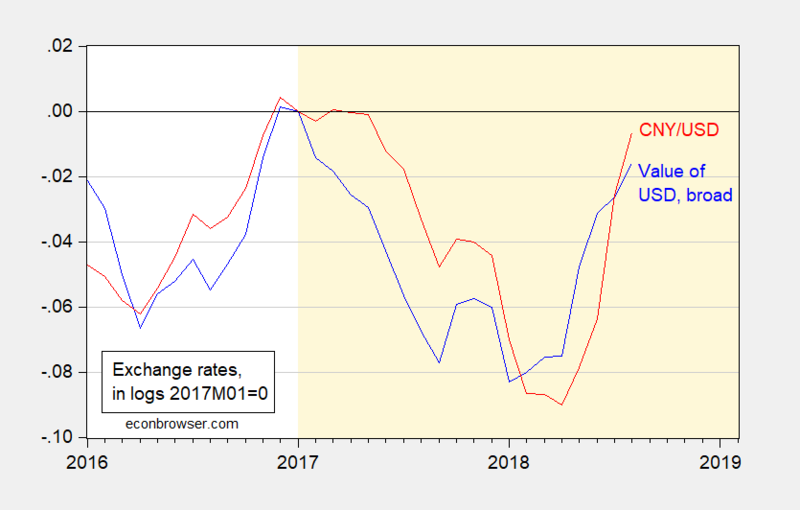 Figure 2: Nominal trade weighted dollar against broad basket of currencies (blue), and CNY/USD bilateral exchange rate (red), both in logs, normalized 2017M01=0. A rise is an appreciation of USD. Source: Federal Reserve Board via FRED, author’s calculations. This entry was posted on September 7, 2018 by Menzie Chinn. Well the payroll survey showed an increase in employment but the household survey showed the opposite. This is why the employment to population ratio fell from 60.5% to 60.3%. We already see PeakTrader highlighted the payroll survey but omitting the household survey. And yea I bet the spinners in the White House will tell us that the unemployment rate stayed at 3.9%. Of course they will omit the fact that the labor force participation rate fell from 62.9% to 62.7%. I would not call this a great employment report. Why smoke and mirrors? We have ~10,000 baby boomers retiring EVERY DAY! That means Aug. 2018 may have seen ~310,000 boomer retirements. Since about 2014 we have seen the labor participation rate slowly falling. I hazard that a large part of this reduction is due to the increasing number of boomer retirements. I would call this a great employment report when for every 2 jobs gained, which matches or exceeds population growth, there are three boomer retirements. Hey CoRev – you may think you are doing a wonderful job of defending the Trump spin machine but by now we all know you are incapable of checking basic facts. The Household Survey clearly showed that we lost 400 thousand jobs. OK the payroll survey showed a small employment increase. Basically it is 2 jobs lost per one survey per every job gained per the other. But of course you would never get this as you never bother to check the facts. DUH! I see CoRev has a knack of just making up numbers. Any source for this excuse of his? Of course not. BTW – most labor economists would note that a decline in the labor force participation rate may be due to discouraged worker effect. As insane as PeakTrader often is – even he gets this point. But not CoRev! CoRev While it’s true that retiring boomers could contribute to a lower employment/population ratio, that doesn’t explain why the employment/population ratio also fell by 0.2 percentage points in the prime working age population (25-54 yrs old). We also need to keep in mind that an unemployment rate that is too low is not necessarily a good thing. A low unemployment rate alongside weak multi-factor productivity and a low job turnover ratio is not good. In this case the one bright spot in today’s labor report is that “Job Leavers” is up to 14% of the total unemployed. https://fred.stlouisfed.org/series/LNS13023706. The bad news is that real output per hour in the manufacturing sector has been moving sideways since 2010. https://fred.stlouisfed.org/series/OPHMFG The risk here is that we turn into post-Brexit Britain. Exactly but remember – CoRev will find some right wing source that attributes this to the 20 somethings playing video games rather than working. He is the master of finding lame excuses in honor of Herr Leader! 81.5% in June 2000 and only 79.3% now. Now if CoRev thinks this is due to old people retiring – then he deserves to be Lawrence Kudlow’s aid! Instead of “hazarding” you could look at prime age labor force participation. Of course, you prefer smoke and mirrors. Exactly – which is what 2slug did for us. Are you expecting CoRev to do actual research? A bar too high. Pgl, actually, it was I who actually did research in trying to explain the change. From which, BTW, I came to a conclusion. Did any of you refute it? Nope. If you can’t see the points, it references baby boomer demographic shift, at least recognizing my point and it also references teenagers going to college a possible partial explanation for 2slugs August rate change. CoRev The FRED data is not for the 23-54 age group, it’s for the 25-54 age group. I don’t consider 25 year olds as “teenagers”. And education tends to be counter-cyclical. Young people are more likely to enter college when the economy is weak and less likely to go to college as the economy and job market improve. First of all CoRev did not tell us the source of his stupid and discredited claim so I seriously doubt he did any real research. Making up BS as one goes is not research. And if CoRev did know how to read the excellent data from the BLS he would realize that 2slug knocked this out of the park. Look – we have suggested CoRev isn’t exactly that bright before but does he have to make it THIS obvious? C’mon CoRev – we were talking about the August employment report. I would not thought even you were THIS stupid. But it seems I was wrong. 2slugs, you do you have a suggestions why it dropped? At least I provided some reasoned research. Pgl, thank you for at least reading my reasoned research. BTW, finding and noting others ideas for why data has changed is far more value than you usually provide. Pgl, it may be longer than what you want to admit since you started school, but Y’ano, just hinting here, August is a key month. CoRev: Why is August a key month in seasonally adjusted data? The entire discussion is worth the read. Too bad CoRev did not really bother. Incidentally, I hope you understand that the overall labor force participation is more than just the 23-54 YOs. CoRev Your comment about seasonally adjusted data makes no sense whatsoever, just as your earlier comment about Menzie’s payoff matrix made no sense. We seem to be talking past one another. Do you understand that seasonally adjusted data takes into account all of the seasonal factors you cited? And do you understand that demographic changes do not explain the employment/population ratio when the population is restricted to just 25-54 year olds? If you want to argue that 0.2 percentage point changes up or down in any one month could be just statistical noise, then fine. That’s a respectable argument. Of course, that still doesn’t explain why the trendline in the 25-54 year old employment/population has been so flat relative to historical recoveries. It was relatively flat during the Obama years and the slope isn’t any steeper today than it was during the Obama years despite all of the Trump fiscal stimulus. I don’t have any special theories to explain why the numbers are what they are, but the chronically weak employment/population ratio among prime working age adults is worrisome. When you scratch below the surface and headline numbers the BLS data are flashing amber warning signs. Something is not right with today’s labor market. Read pgl’s link to Jared Bernstein’s blog. The wage and compensation data is not consistent with an economy humming along at 3.9% unemployment. Look at the hourly productivity data, and especially multifactor productivity numbers. Try reading the explosion of recent papers on labor market monopsony power. If you’re really concerned about the economic problems facing Trump’s base, then you need to look deeper than the headline unemployment numbers. And cheering for more tax cuts and deregulation isn’t helpful. 2slugs, I’m sorry, but your explanation had me laughing out loud so hard it brought tears. Going back tot he Menzie matrx was hilarious as to its irrelevance and exemplary of your off topic contributions. Some of what you provided possibly true, with the exception of you claim: “Do you understand that seasonally adjusted data takes into account all of the seasonal factors you cited? And do you understand that demographic changes do not explain the employment/population ratio when the population is restricted to just 25-54 year olds?” Only you brought up the cohort while the subject has been the labor force where both my theses apply. Don’t beat others up for not following your unique or off topic paths. I don’t intend to pursue this further. CoRev Everyone here except you understands why it’s important to look at the prime working age numbers. If the reason for the drop in the overall employment/population was due to demographics, then you would not expect to find the exact same drop in the prime working age number. So there’s more to the story than just demographics at work here. Only you brought up the cohort while the subject has been the labor force where both my theses apply. I get the feeling that you don’t understand what the FRED and BLS data mean. The subject that pgl brought up was not the labor force, it was the overall employment/population statistic and the fact that it had declined and is lower than it should be. You then tried to explain it away by appealing to retiring baby boomers and teenagers going to school instead of entering the labor force. The problem with your explanation is that it doesn’t explain why the employment/population ratio for prime working age folks (25-54) also fell by the same amount. That cohort excludes teenagers and excludes retiring baby boomers. Understand now? 2slugs, it appears the employment/population ratio for 25-54 year olds has an upper limit of around 80% (perhaps the dot com bubble brought a few more off the sidelines-but not by much). it is possible that we slow down the rate increase as we approach 80%, because you begin to converge on the folks who will probably never enter the work force, no matter the incentives (i.e. stay at home moms, elder parent caregivers, etc). i would suggest that when the ratio is in the 6o’s and lower 70’s, you can get more clearance of the not employed to work with the proper incentives, but there must exist a certain percentage of the population that will probably never work, right? so it may be very difficult to get higher rate increases as the ratio approaches its limit? What is the problem with checking the data for the 25-55 years old age group? What is the US performance in this group in comparison to other countries for 2008-2017? 2018 and increased 2.5 percent from the same quarter a year ago. Hmmmm…..Makes one want to refer back to Menzie’s post on industrial equipment investment. The fact is job growth is well above 100,000 per month, suggesting significant slack in the economy. Also, those working part-time declined by over 800,000 in the past year. Granted but maybe you do not realize the history of how your boss Lawrence Kudlow uses these two series. Back in the Bush43 slow recovery days, he would tout the Household Survey as the most reliable whenever it showed more employment increases than the Payroll Survey. Of course when it showed less employment growth than the Payroll Survey, Kudlow would declare the Payroll Survey as the most reliable. Good to see that you are continuing in this fine Kudlow tradition! Seriously Peaky? I know that some snake oil type lawyers hire the bottom of the barrel for supposed expert witnesses but I have yet to see any of them go this far to the bottom. But I’ll give Tom a little credit – his writing on this topic is far, far better than the intellectual garbage your boss (Kudlow) has written in the past. It’s likely we’re creating 175,000 to 195,000 jobs per month on average. That average will continue to decline the closer we get to full employment. When the trend falls towards 100,000 per month, we’ll be at full employment. This is such a low level discussion of this issue. I was about to give you credit for knowing more than CoRev knows (a low bar) but maybe you should start reading what CoRev is at least trying to say. Maybe between the two of you – an insight might pop up here or there. What is so dumb about PeakTrader’s latest? He seems to think we are at full employment when employment is growing at the same rate as population is growing. Now if we were at the natural rate of the employment to population ratio (EPOP) then this would be fine. But we are not so one would hope employment would be growing faster. Of course EPOP fell in August. OK EPOP and the labor force participation rate are measured by the Household Survey not the Employment Survey. And there are months like August where these two surveys give conflicting signals. I would argue we are below this natural rate and I think PeakTrader agrees. But let’s suppose aggregate demand growth is such that we stay at the same low level of EPOP. But Peaky’s latest bizarre reasoning we would be at full employment even though we would be clearly below full employment. Look we need to provide at least an educated guess of what the natural rate of EPOP is and it is certainly not 60.4%. Not even close. CoRev tried to insist otherwise but noting what everyone knows – there has been some demographic shift since say 2000 when EPOP was above 64%. But gee – NO ONE is saying we should have EPOP strive for 64%. Well maybe Gerald Friedman might as he thought we could reach 66%. But that was one truly dumb paper. If we factor in the CoRev demographics, I would be the natural rate of EPOP closer to 62%. Now if CoRev can find some magic arithmetic that 60.4% equals 62%, maybe he has a point. Otherwise he and PeakTrader are chasing their tails as usual. Ah but Jared et al. have reviewed these claims and note that the CEA is being misleading. Before Trump – the CEA was known for some useful economic analysis. But now – it can be counted on to rival KellyAnne Conway! The sad thing is that nothing Doug Irwin wrote should be a surprise to anyone who is the least bit acquainted with international economics. This is all stuff that would be covered in the first day or two of a freshman course, yet Donald Trump doesn’t get it. And apparently his base doesn’t get it either. But then again, we now have yet another book reminding us just how stupid Donald Trump really is. It has been years since we have had employment opportunities this positive with increasing wages. Has BLS correctly guessed the impact on the labor force commonly working this duration at this time of the year? How much certitude do you have that these survey estimates will not be adjusted? It’s not released yet and Dr Manski has requested prior permission for releasing/copying portions, BUT HE HAS RELEASED PUBLICLY AT ANOTHER SITE. So go to the paper and search on BLS. This is from some blovating ala CoRev dated 1:11 PM. He continued by accusing me of writing incoherent junk. Can I just reference everyone to my comment just two minutes earlier that cleared everything up per this discussion with a focus on the demographic shift. Of course CoRev as always refuses to read actual analysi as he just write his own incoherent and quite often dishonest babble. I rest my case! Looks like the price of the wall Mexico isn’t paying for is on its way up. Prevailing wage rates should be booming for the various laborers (carpenters, iron workers, Teamsters, electricians, heavy equipment operators, asphalt workers, et. al.) who will be needed. Road work alone–necessary roads will have to be constructed to bring materials to various sites–should be interesting. All jobs will also come with plenty of good fringes, as they should. Not unreasonable to think median wages will top $35/hr. plus benefits. Cost of materials? Up! Up! Up! Especially given the 35 foot concrete wall Trump promised to build. One current problem? Shortages of skilled workers in numerous trades. And a second problem? Spending considerable time in the southwestern deserts where little infrastructure currently exists and temps from mid spring to mid fall can be nasty. More money will probably entice more workers. It would’ve been much better if Trump was President in 2009-17, to execute a big public works program sealing the border, along with engineering constructive economic, social, and foreign policies. No place for woulda, not forcoulda. He promised in 2017, not 2009. The car I coulda bought on 2009 woulda cost less than the one I bought in 2017. Duh. So, you don’t believe in conterfactuals or opportunity costs. trump did not run or get elected in 2009. it is not really a counterfactual. it is a fantasy. In 2009, Trump’s biggest success was understanding what Gary Busey was attempting to say. And firing LaToya Jackson. A counterfactual means it didn’t happen. Perhaps you were looking at data going way back. But since the economy evolves, recent data is usually best. In the two most recent expansions before this one, the trend you refer to is shallower than the trend this expansion. Starting data of prior expansions, the lows of Feb ’93 and Oct 2003. Oct 2011 is the natural starting point of the uptrend of this expansion. Prime age emp/pop is actually rising faster this expansion when reckoned from these starting points. By eye, it is also rising faster if wish to use the first month of recovery as the starting point. Now you say the slope isn’t any steeper today than it was during the Obama years despite all of the Trump fiscal stimulus. Yet the last 11 months lie above trendline, meaning Trump’s most recent year has outperformed. Why then would you say this about Trump? When I first read this I said to myself, “Wow here’s an anomaly I didn’t know about. I must learn more.” So I checked it out. Turns out not to be an anomaly at all. Hard data to date on many fronts, including this one, confirm that the economy is improving under Trump. JBH I should have been clearer. I wasn’t referring to the entire Obama years. As anyone can see, the emp/pop trend for 25-54 year olds was trending down beginning with the Great Recession through Sep 2015, when it bottomed out and started to trend upwards from that point onward. Since bottoming out in Sep 2015 the slope of the increase under Trump (Jan 2017 – Aug 2018) is no higher than it was under Obama beginning in Sep 2015. In other words, there is no obvious structural break occurring with the Trump presidency. Whatever caused the emp/pop ratio to turn around in Sep 2015 (and I don’t know what that was) is still operating today, although it is showing signs of starting to flatten out, which isn’t altogether surprising given how long in the tooth this recovery is getting. The bigger mystery is why it isn’t higher given that we’re sitting at a 3.9% unemployment rate. 2slugbaits: Choosing beginning and end points when comparing trends is often problematic. I will certainly not quibble with those that you chose. What we have before us is something not yet explained. Looking at the male and female prime age labor force participation rates since Sep 2015 is not very helpful. What’s really necessary is to see beneath the surface. I’m wondering about the fertility rate. Data on this lags badly, by around a year. My tentative hypothesis is that young females who had put off having babies may with perceived sense of a better economy under Trump have begun dropping out of the labor force. However their emp-to-pop rate really jumped the last few months. Another thing is anecdotal evidence of 26-year olds living at home off their parents. Another thing is the mesmerizing attraction of today’s computer games. Another is legalization of marijuana, though not that widespread yet. There is also a phenomenon known as ghosting. I am grasping at straws here. In contradistinction we have NFIB data that show the fastest rising problem of small business is finding qualified workers. One point off the 45-year historic high. Something is keeping able-bodied people from not going to work. Indeed one observation does not make a trend. Check out the first graph. One month down is all we have. This came about because mnf hours fell a tick and mnf employment fell by 3,000 workers. As auto workers fell by 4,900, we can take the argument directly to the auto sales cycle. The current cycle is long in the tooth. Domestic demand for autos and light trucks topped a year ago September. Last month’s unit sales was the lowest of the bunch. No matter where this might go in coming months, the data to date are mostly a phenomenon of tepid domestic demand in this manufacturing sub-sector. So what does this have to do with trade? Other than speculation. Are domestically produced auto sales going to fall because of higher prices on imports? “Ford Motor Co. and General Motors Co. would be immediately impacted by tariffs, said Moody’s, as both import a large number of vehicles to the U.S. from Canada and Mexico. In GM’s case, about 30% of its U.S. unit sales are supported by imports, while at Ford, the comparable figure is 20%. … Both GM and Ford would need to absorb the cost of scaling back Mexican and Canadian production and shifting some back to the U.S. … Non-U.S. car manufacturers will be hit harder than their U.S. rivals, particularly those companies that do not have plants in the U.S. … Mexico would be hurt more than other markets as many big car makers have assembly plants there to serve the U.S. market. Mexico produced 3.8 million vehicles in 2017, 82% of which were exported. Of that total, 84% went to the U.S. and Canada.” (Barrons June 27th). Here’s an alternative way of looking at the employment report. The long end of the yield curve is the unbiased arbiter. Payroll employment (Table B-1) up just 151K before revisions. Neutral for bond prices. Unemployment rate (T A-1) unchanged at 3.9%. This number has for years proven to be the best overall summary of the Table A household survey data. The bond market nearly always ignores household employment, as most of that information is subsumed into the headline unemployment rate. Neutral for bond prices. Average workweek (T B-2) unchanged at 45.5 hours. Neutral for bonds. Hourly wage of production and nonsupervisory employees (T B-3) – the granddaddy series – up 7 cents plus another penny due to revision. Very bad for bond prices. For an overview of this report none are as important as these four components. Keep it simple. Weigh these four equally. If you wish to be more refined, double weigh payroll employment. Bond prices should have fallen modestly on this report, perhaps a quarter of a point. Instead the market chose to focus on the wage gain and the 10-year yield surged. Up 6 bp on the day. The bulk of the move was over by the end of the first hour. The wage gain signal was instantaneous pro-growth, though pro-inflation also but with a long lag. Note the methodological technique of mapping key x-variables from this report into the y-variable of the change in yields on the day of the report. Think nothing of what the Jan Hatzius’s of the world say. You can take control of the analysis using this methodology. Get a grasp of how the news of these four parts is going to affect the price (yield) of the 10yr on the day of the report. If all four parts are unanimous in either direction, bond futures are likely to close the day within a few 32nds of the intraday high (or low)! This is an amazing statement. One you yourself can back test if you take the time and trouble. Time after time over the years this exact pattern happens. So if you could forecast these and only these four components of the emp report ahead of their release, probabilisticly you could make a fortune buying (selling) bond futures ahead of the open and then closing out your position within the hour. If all four components lean on one side of the ship, the instant the release comes out the market will surge in the appropriate direction. You can prove this latter point to yourself by examining the 5-minute futures chart on bonds. On future employment report days, watch the spin on this site. Were it a cue ball, the spin sometimes flings the ball off the felt. A good litmus test for any report is: Does it raise (lower) long rates. Since the emp report is so multifaceted, it pays to have a summary measure of the data of this large and important report. In most cases, higher long rates imply that overall the report was pro-growth. The technique I outline here is designed to be unbiased. I developed it out of real world trading. It can be applied to most all reports no matter who is in the Oval Office. All readers now have this as a benchmark and so can do their own independent thinking. Why do so many on this site spin the minutia of reports against this president? The hatred for Donald Trump on this website is palpable. Posters here put their thumb on the scale to turn your head away from a scientifically-based unbiased analysis to make political points. As Trump would say. Sad. It is still important to remember that the surge in industrial production is driven by energy. The Y/Y Ch. in energy is up 8.3% while non-energy is up only 2.8%.